Galeto Na Brasa recipe for chicken lovers. 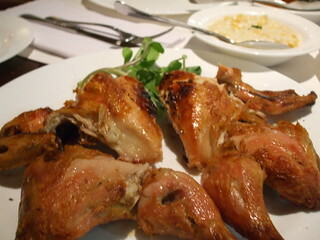 Our Brazilian BBQ Blog Galeto Na Brasa recipe for chicken lovers. Chicken! Lets talk a little about this feathery subject. As you probably know Brazil is a very multicultural country, most recently, we have had influences from Turkish and even American immigrants. However, there a lots of cultural aspects that come from the older immigrant waves, the Italian and German in particular. Now for the churrasco related bit: Galeto. It is essentially a young chicken, but it is much much more than that when made just right! It is a whole speaciallty just by itself. If you remember my other article about south american churrasco (the trinational one), this one has elements similar to those. The best galeto in Brazil, the one in the city of Bento Gonçalves (near Porto Alegre in the wine region in case you go by there) starts with the meat marinating for at least 12 hours. This marinate is made of white wine, beer, garlic, chilly pepers, onion and assorted herbs. To be a galeto, the chicken has to be at most 1 month old, and weigh about 500g (about 1.5 pounds). After marinating, you just have to grill the meat to your favorite temperature. Because of its Italian origins, there are some side dishes that can’t be missing when eating a Galeto Na Brasa barbecue: fried Polenta and spaghetti. At first, dissolve the corn flour in two cups of cold water. Heat a pan that in medium hea t and add the oil, onion, garlic and salt. Then add to the pan the dissolved corn flour, stirring preferably with a wooden spoon, for about 15 minutes until iyou get a very firm consistency. When firm, pour onto a tray, cut in stripes, coat it in dry corn flour while still warm and deep fry in very hot oil. Serve Gelato Na Brasa with good red wine and a smile! Words by Olívia D’Orsi Junqueira.